Why should you order comics from Radiator Comics for your business? Radiator Comics specializes in distributing hand-made comics that focus on self-expression, great story telling, and character development. Radiator’s Comics are smart, funny and beautifully drawn. Our comics range in both style and subject matter the same way titles at your local bookstore do. There’s a comic out there for everyone. Radiator Comics can work with you to find comics that fit with your customer’s aesthetics. Whether it’s scrappy zine comics, or lushy inky comics, hilarious joke comics or serious autobiographical chronicles, Radiator Comics has comics your customers will love. It’s easy to order from Radiator Comics! Our website has tons of information, to make you feel confident on what comics to order, and easy to navigate. Radiator Comics is also available to guide you through any step of the process. We are so confident our comics will be an improvement to your business, the comics you order are returnable at any time. When you order from Radiator Comics, you are directly supporting alternative comics creators. 83% of the money from wholesale purchases goes directly to the authors of the comics you are purchasing. Small businesses, librarians, educators, and educational institutions are among those eligible for wholesale accounts. If you’re unsure of your eligibility, please fill out the application, and we’ll be in touch with you. If you are an individual purchasing comics for your enjoyment, you are NOT eligible for a wholesale account. Once your account has been approved you will receive an account number. Wholesale customers receive a 40% discount on orders for their businesses. A minimum of $20 (retail) must be met in order to receive the 40% discount. Wholesale customers can order through both Radiator Comics’ website or via email. Radiator Comics will issue a net-30 invoice. Any damaged items must be reported within 10 business days of receiving an order. Radiator Comics currently charges a flat $5.00 shipping and handling fee for all orders. Any shipping costs beyond $5.00 are covered by Radiator Comics. Wholesale customers are responsible for the initial $5.00 associated with orders and all shipping costs related to returns. Radiator Comics is responsible for for shipping costs associated with correcting damaged orders. Items purchased with a wholesale account are intended for resale by businesses at Radiator Comics’ suggested retail prices, or for educational purposes in venues such as libraries and schools. Wholesale customers agree not to resell Radiator Comics’ titles at a wholesale discount. Whole returns of comics in sellable condition are accepted at any time. DO NOT strip the covers of the comics. Stripped covers will not be accepted. Radiator Comics must be notified of returns before they are shipped to us. You must provide Radiator Comics with a tracking number so both Radiator Comics and your business can track the return as it is shipped. A packing slip must be included in the shipment listing the invoice number from which the comics were initially sent. The buyer is responsible for the cost of shipping returns to Radiator Comics. Radiator Comics will notify you as soon as we receive the return, and will reimburse your business the wholesale price of the comics within 10 days of receiving the return. Radiator Comics reserves the rights to change these terms, at any time. Radiator Comics will make every effort to notify all wholesale customers of any changes to these terms. 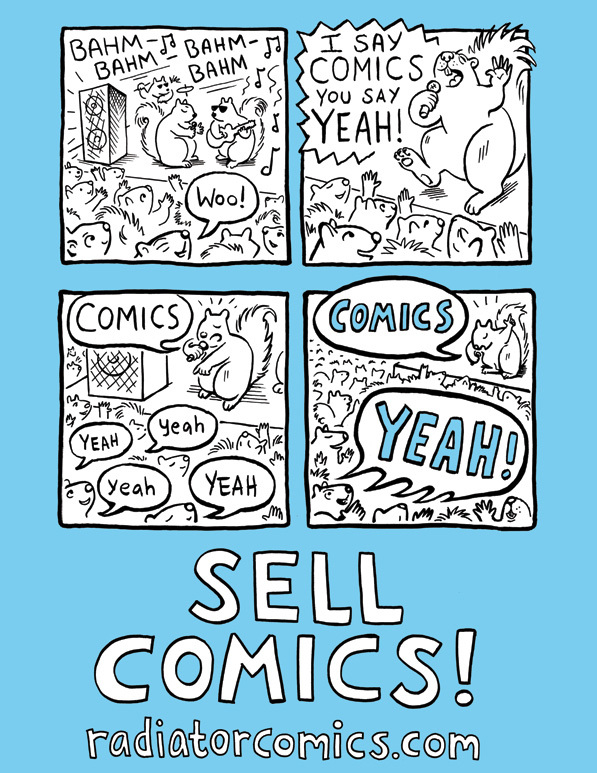 “Sell Comics” postcard art by Cara Bean!